As I rise out of the wrapping paper debris and general holiday craze and settle in to enjoy a few days off (without any big obligations), I decided that I should get back to posting here. In the spirit of a fresh start in 2015, I’ve set out to tackle a few household projects that have been looming over my head for the last few months. The biggest? Cleaning the inside of the oven. We cook a lot in our rental oven and are great about keeping the outside spotless (seriously, it looks brand new) but the inside…well that’s another story. 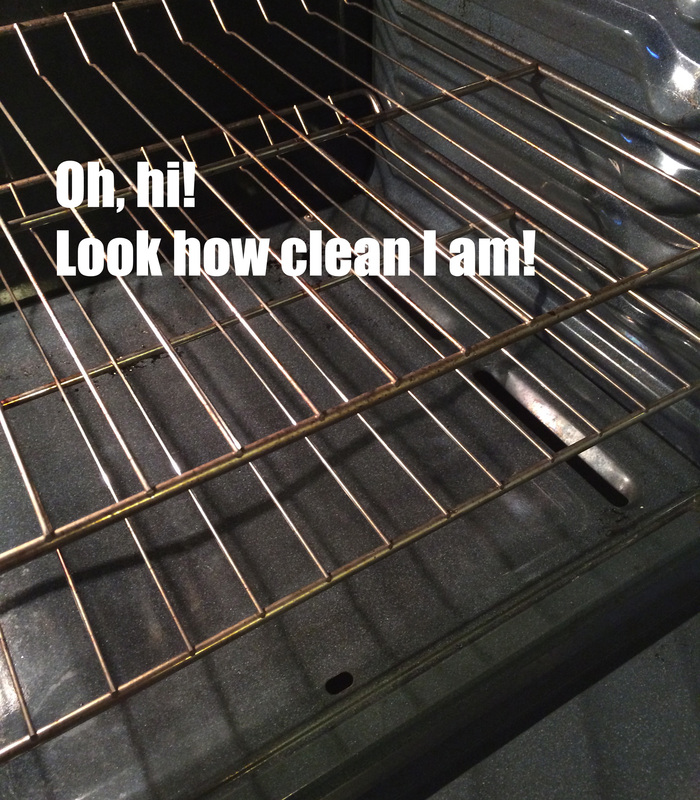 Last year, I began a search for a less toxic way to clean the oven (most oven cleaners contain a bunch of harsh chemicals). I kinda gave up for a bit after striking out online & in local stores. And then Jess found this post by one of our favorite bloggers. It worked like magic using items we already had in our pantry (baking soda and white vinegar). Seriously! I didn’t have to scrub much but be prepared to get on your knees & climb into the oven for an hour or so. 1) Clean the bottom drawer/broiler last (I cleaned it first and had to clean it again because it got bits of baking soda paste in it as I was wiping out the oven) — I just washed it in the sink but I wished that I’d done it once at the end versus 2x. 3) The baked on spatter on the oven window didn’t budge…at all. The Kitchn also has a post about this and recommends a Norwex cleaning product. Hmmm, I might have to investigate. On another note related to cleaning insides…mine…holiday treats and time off at home without a good post-holiday vacation grocery shopping have me feeling kinda ick. It’s not so much a New Year’s resolution. Rather it comes out of a need to get back to basics and pay more attention to what I’m eating — basically my body is telling me that it needs healthier stuff. I’ve thought about doing a cleanse (I’ve had good luck with “clean eating” cleanses in the past). I’m halfway through the book about Whole30 “It Starts With Food”. It’s super educational but I’m not sure it’s for me. I also saw this in our recent copy of Bon Appetit and thought it seemed like a good option. Ah, options! In the meantime, I’ve got almonds soaking for homemade almond milk (for smoothies) and I added some sautéed kale to my leftover pad thai lunch today. Things are looking up. Have any cleaning tips or healthy eating favorites to share? Tell us! Wishing you and yours an awesome start to 2015!